Lewisham is one of the twenty Deaneries (geographical areas) which make up the Catholic Archdiocese of Southwark. 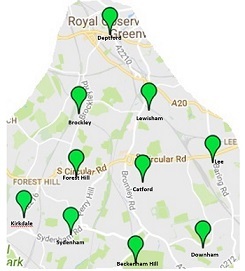 The Lewisham Deanery serves the following ten parishes: Beckenham Hill, Brockley, Catford, Deptford, Downham, Forest Hill, Lee, Lewisham, Sydenham and Sydenham Kirkdale. This website provides information for and about the parishes, the clergy, the Deanery Pastoral Council, of which the Chair is Mike Sheridan of Our Lady of Lourdes Parish, Lee, and the Deanery Clergy Council, of which Fr Sam OFIA of The Annunciation and St Augustine Parish, Beckenham Hill is the Dean of Lewisham. The website is designed to give you quick access to the Catholic Parishes and schools in Lewisham as well as news about upcoming events and activities. The Parish page gives times of Masses, contact numbers for clergy and details about sacramental preparation including Baptism and Marriage. Where parishes have their own website there is a link. Some parishes have their weekly newsletter on their website which provides more current information. The schools' page provides with contact details of the Catholic schools in the Deanery to enable you to enquire as to the admissions policy and how to enrol your children. There is a useful link page giving you access to the Archdiocese website where more information is available about Catholic life in South East London. The website will be regularly updated and will respond to the needs of the Catholic population within the Lewisham Deanery. We are lay members of the Lewisham Deanery authorised by our parish priests to represent our parishes in a pastoral council. 2. To take part in an ongoing conversation with the Deanery Clergy. The DPC will converse with the Clergy Conference. Individual members will converse with their parish clergy and organisations. 3. To represent parish communities in a deanery context. 4. To facilitate the sharing of resources where appropriate e.g. catechists. 5. To network with other groups within the community, e.g. Marriage and Family life team, Ecumenical organisations, relevant borough organisations, Diocesan organisations and Schools. 6. To operate and maintain a Deanery Website. 7. To enable people to experience the wider church community of which their parish is part. 1) We will meet regularly in order to effectively liaise with the Clergy Conference. 2) We will elect a Chairperson, a Vice-Chairperson, a Secretary and a Treasurer annually at our AGM. Terms of office will not usually exceed 3 consecutive years. 3) We accept appointments from our parishes (3 members per parish) for a fixed term and we undertake to renew our commitment annually at the Deanery Mass. 4) The ten parishes within the Deanery will provide funds in order to implement the planned catechetical programme of formation and training for the coming year. The funding will cover the working costs of the DPC events, including the use of external speakers and consultants. The treasurer will regularly advise the DPC about planned expenditure so that funding can be increased as and when the need arises.